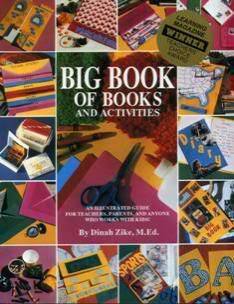 The Big Book of Books and Activities by Dinah Zike is a black and white, 128 page resource for paper crafts and minibooks. I’ve owned my copy for several years, and I still pull it down for ideas. Now that my daughter is ten, she can look up papercraft ideas herself in this easy to use book. What I love most about this book is that it is both crystal clear and supremely practical. There are 41 different projects, mostly minibooks or “foldables” as Zike calls them. But some of them are activity ideas such as using macaroni in crafts or making homemade sidewalk chalk. Each project includes step by step diagrams and written directions for how to make the minibooks. In addition, there are lots of photographs (black and white) and written suggestions for specific uses of the minibooks. For example, on the page showing how to make Circle Stands, Zike tells you to “use circle stands to hold labels, vocabulary words, information cards, and more.” In the layered look book section, she suggests, “Cut layered look books into sections for comparing and contrasting, cause and effect, or for recording data, as illustrated by this experiment book.” These kinds of tips are good for kick starting your own creative applications. Zike also shares some organizational tips for your supplies (mostly geared towards classroom teachers, but still applicable to a homeschool setting) and teaches the names of the basic folds which she references throughout the book. A Charlotte Mason purist probably would not think much of these paper projects. They are the kind of “bells and whistles” they consider distracting from and unnecessary for real learning. But if your child is artistic or creative or prefers a more hands-on approach, making paper projects can be an excellent way to narrate what was learned. Miss Mason did recommend written narrations for children once they are able to do so. I see these paper projects as a creative style of written narration. After a reading assignment, offer your child a paper project to assemble. She can write or draw (depending on her age) her narration onto the minibook. An older child may enjoy choosing his own project from the possibilities in the book. This book is unavailable new at Amazon, but can still be bought at Rainbow Resource, my favorite homeschool retailer. Written by Jimmie, Charlotte Mason flavored mom of one. Really nice blog you all have here, the latest post stood out on Stumbleupon. You have some great resources for children. Thanks, Tony, for visiting The Curriculum Choice! We appreciate your support. I use the book through my library. For those of us that don’t have it at our fingertips. I found that the explanations found on CurriculumShare.com are just great. BUt the book of books is great!